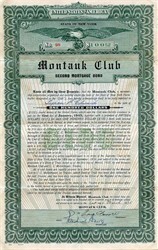 Beautiful certificate from the Montauk Club issued in 1935. This historic document was printed by the Goes Company and has an ornate border around it with a vignette of an eagle. This item has the signatures of the Company’s President, Frank Russell and its Secretary and is over 74 years old. Signed on back by Trustee, C. C. Mollenhauer. This is the first time we have had this certificate for sale and we only have one. The Montauk Club is a private social club located at 25 Eighth Avenue in Brooklyn's Park Slope neighborhood of New York City. The Club was founded in 1889 by prominent Brooklyn residents excited about Brooklyn's economic boom following the construction of the Brooklyn Bridge. The founding members of the Club included Charles Pratt, Richard Schermerhorn, and Edwin C. Litchfield. Since its erection, the Club has hosted prominent political figures including former U.S. presidents Grover Cleveland, Herbert Hoover, Dwight D. Eisenhower, John F. Kennedy and Senator Robert Kennedy. In the late twentieth century, the Club faced declining membership and financial difficulties. It eventually sold its upper two floors. However, the clubhouse has enjoyed a revival in recent years. A "house subcommittee for under 35s," also known as the Stephen Talkhouse Fellows, has attracted new membership. The Corduroy Club holds meetings at the Montauk Club on January 1 (1/11) and November 1 (11/11), the dates most resembling corduroy.In 2007, the bar and dining areas of the Club began hosting events aimed at young men and women in the rapidly gentrifying Brooklyn neighborhood. In opulent late-nineteenth-century Brooklyn, clubs – both men’s and women’s – sprang to life by the dozen; the Hamilton, the Crescent, the Union League, the Unity, the Germania, the Brooklyn, the Carlton, among many others. Park Slope had begun to rival Brooklyn Heights as the borough’s prime residential area. The 1890 Census Bureau reported that Park Slope had the highest per capita income in the country and its residents were the leaders of Brooklyn society. And so it is not surprising that a group of 25 men met one day in 1888 in the home of Norton Q. Pope at 241 Park Place to form the Montauk Club. On March 11, 1889, the State of New York issued a Certificate of Incorporation. Within weeks, the new club had drawn some 300 subscribers, making it necessary to lease the brownstone at 34 Eighth Avenue temporarily while they awaited completion of their new clubhouse. To build their new home one of New York’s finest architects was chosen: Francis H. Kimball. Kimball had just completed the Corbin Building (still standing today on the corner of Broadway and John Street), and had earlier completed two exquisite churches, also still standing (Emmanuel Baptist Church, Lafayette Ave. and St. James Place, Brooklyn 1887, and Riverside Presbyterian Church, near Spuyten Dyvil, 1888) and was to go on to design the two huge buildings just north of Trinity Church in Manhattan, the Trinity and U.S. Realty Buildings on Broadway. Today, a century later, all of Kimball’s buildings still call forth admiration from architectural critics. Kimball was noted for his subtle interweaving of different traditional styles. The Montauk Club, however, is pure Venetian Gothic, a romantic style popularized by the English architectural critic, John Ruskin. Its inspiration was the Ca d’Oro on Venice’s Grand Canal; the Quatrefoil (four-lobed) windows and pointed arches of the Club are taken directly from the Ca d’Oro. Kimball was an early user of terra cotta ornamentation, the molded clay material that was just becoming fashionable. It is visible throughout the Club’s exterior, forming the surrounds of the windows and enclosing the columns on the balconies. The Indian faces that compose the capitals of the columns are of terra cotta, as are the Club’s two friezes: One, running around three sides of the building depicts scenes of the Montauk Indians; the other, above the main doorway on Eighth Avenue, shows the laying of the building’s cornerstone. The subtle coloration of the structure, from dark brown to tawny yellow, reflects the restricted range of materials used: brownstone, yellow-orange brick, ivory and amber terra cotta, red Spanish tiles for the roof. Between the three lower stories and the two upper stories, Kimball inserted a balcony that ran around three sides. For structural reasons, this was later removed. Kimball’s plans were very specific in the uses they called for. The First Story: Two flights of stairs from the street led to this floor. The small flight on the left, as one faced the building, led to the Ladies’ entrance. A lady could enter the elevator here or, if she chose, ascend the ladies’ staircase on that side of the building that led to the third story. The large flight lead to the Reception Room which found the same use in Kimball’s day that it does today, but beyond it the long salon was designated as the Reading room; and beyond that, the Plaza Street room was called the Morning Room or Café. The room next to it was used for a buffet (now the kitchen). There was another coatroom – the present ladies’ room. The Second Story: Billiards, the game of the hour occupied the two main areas, both called Billiards rooms. There was no bar. The room off the present bar served as a Buffet. The small room to the right of the staircase was the Board room and the present Board room was then two rooms – both Card rooms, as was the room next to it. The building cost a total of $232,272 — $40,000 for the land, $162,686 for the building and $29,586 for the furnishings.